Our product range includes a wide range of fully automatic kurkure production line and batch type kurkure fryer. Owing to our extreme prowess in the domain, we are developing highly demanded Fully Automatic Kurkure Production Line. We are providing the highly functional and cost effective production line suitable for making savory snacks and fryums. 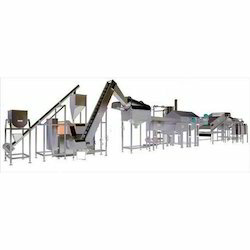 The offered range comprises of highly advanced and innovatively designed equipments such as vibratory feeder with hopper, pre oil tumbler, frying system with continuous oil filtration and heat exchanger, oil tank with cooling system, de-oiling conveyer, linear feeder and flavor applicator & drum. The production line features output capacity of 500kg per hour and it is accessible from us with 13HP and 14HP motor that can be ordered at a competitive price. We are well acclaimed as reliable firm offering widely demanded Batch Type Kurkure Production Line. The offered machinery is gaining wide acclamation for its capability to provide consistent and better product quality. Designed from robust grade components the offered production line renders automated temperature control and unmatched output capacity of 200kg per hour. Further, the energy efficient production line is compliant to the set industry standard and our prestigious clients can order it from us at an equitable price.